Everyone is in a state of high excitement, as finally, The Weather has worked out it is July, and therefore, some sunshine and a little warmth to the breeze is highly appropriate. I suspect The Weather will realise the error of it's ways shortly and whack us with a tremendous thunder storm. 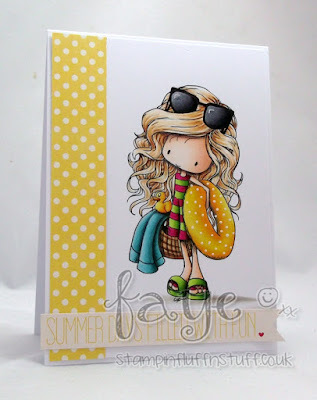 In the meantime, new challenge over at Tiddly Inks... Summer Sun. Fab timing, or what?! Wow so beautifully coloured. I did her yesterday for an upcoming challenge - should have got inspiration from you first! Oh my goodness, this is fantastic!! Hope the weather stays nice for a bit before you get whacked with a storm! Stunning colouring! I'm loving the cas design too! 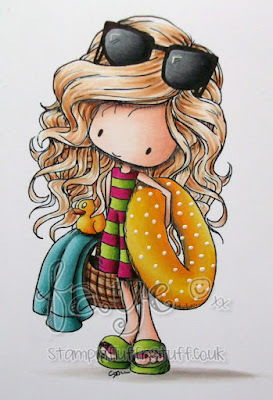 Molly looks all set for the sunny weather and I am certainly enjoying it too...although I could do with a paddling pool! *sigh* If only that was me! with a tremendous thunder storm.